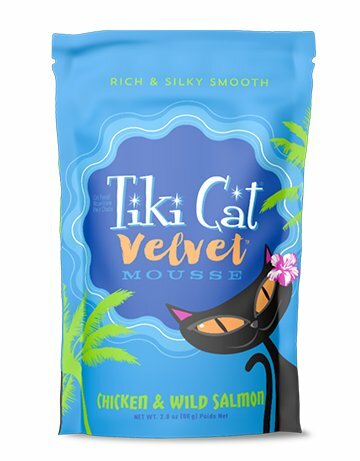 Home » Tiki Velvet Mousse Cat Pouch Chicken Salmon 2.8 oz. Tiki Velvet Mousse Cat Pouch Chicken Salmon 2.8 oz. Tender chicken, wild Alaskan salmon, chicken broth and sunflower oil blended into an indulgent, creamy mousse. Recommendations vary greatly, based on your cat’s age, activity level and life stage. For adult cats, feed approximately two pouches per day per 7 lbs. of body weight. Serve at room temperature, and refrigerate any unused portion.